Starting preschool is a big deal in Japan. It's a “big kid” step, and as such can be a mix of excitement and stress for the kid, Anthony included. It puts parents in a difficult situation, because while you want to play up the excitement, you do so at the risk of playing up the stress. He gets, for example, the excitement of a new backpack and thermos, but then has then has the stress of having to carry them. Of course, just going can be stressful in and of itself. One big difference to Anthony between daycare and preschool is that he now gets to bring his own lunch. This is a big deal, and because of the masterful way in which Fumie handled it, it's a big deal that is devoid of stress. In addition, the rest of the lunch-related things are Shimajiro (chopsticks, spoon and fork, bag to carry it all in), so it makes a nice set whose neatness even Anthony can appreciate and enjoy. As the Mom, Fumie is of course concerned with preparing a healthy meal, but that doesn't matter if he doesn't eat it, so she puts a lot of effort (forethought, testing, and execution) into making fun and tasty meals. The bento in the picture at the top of this post is the second one he brought to school. The cooked carrots are cut into shapes (airplane, and teddy/Shimajiro heads). The apple slice is in the profile of a bunny. He loves everything in it. It was all made fresh in the morning, just before he left. Fumie made sure that he got to “help” make it, so he had “vested ownership”, so to speak. The same was done with his first school bento, shown here. It wasn't actually his first bento, though. 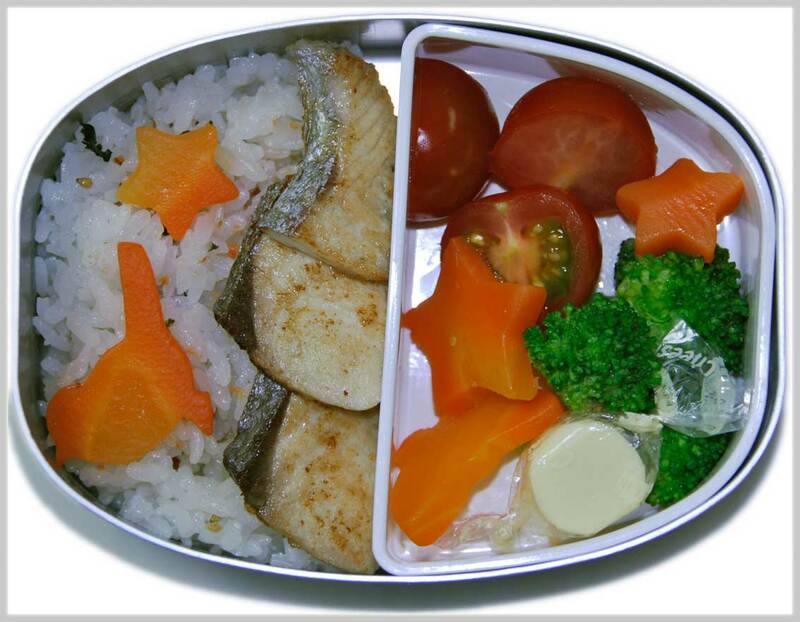 A week prior, Fumie had conceived a “preschool pretend lunch day” with Anthony, where she prepared a bento for him and he ate it while pretending he was at preschool. It was all fun and excitement, and he really enjoyed it. By the way, when I said that the bento experience is devoid of stress, I was talking about Anthony. It's highly stressful for Fumie because it's so much work and so much is riding on it. He might feel stress and pressure if he can't finish on time, so she's made sure that he can handle the setup and cleanup of all the bento things himself. 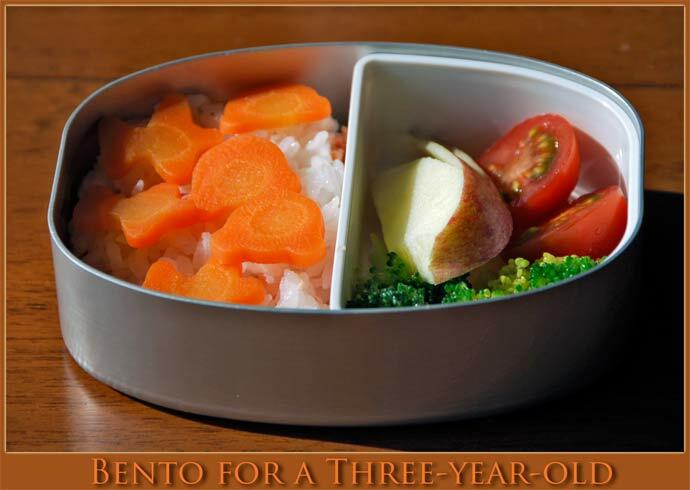 (Not all bento boxes sold for his age are actually appropriate for his age.) She prepares each bento so that it's easy and fun to eat, and has positioned the whole experience as one where things go smoothly and he feels accomplishment. I wouldn't have even thought of most of this stuff; she's really done an exceptional job with this. During a normal week, Anthony brings a bento four days (Wednesday is always a half day, so lunch is at home), and the bento is still the focus of those days. When he wakes up in the morning, he always wants to know whether today is a bento day, and he's proud to carry the bento himself. In the end, it's food, so it has its own built in measure with which to gauge success: He's never left a single bite uneaten. 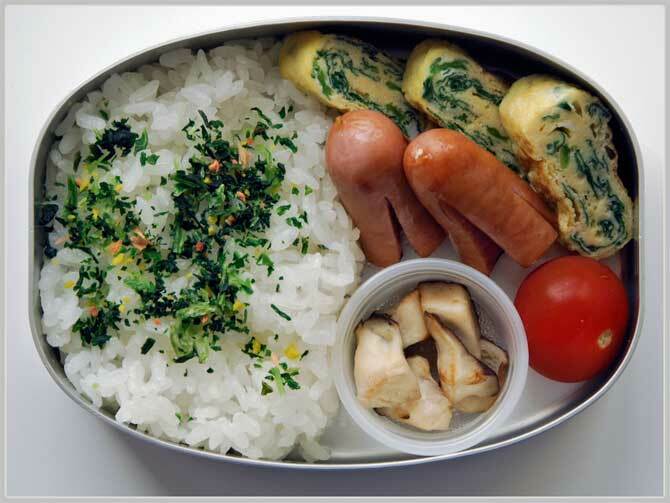 You can see all his bentos, updated each morning one is made, at the Anthony's Recent Bentos page. Do you think that the Japanese teachers reinforces what you are trying to instill in Anthony? And this somehow helps convey a consistent message about responsibility, eating healthy.. Etc? At 3.5 yrs, I think Anthony is much to young to know or care about “eating healthy” — he’ll generally eat whatever we give him, so we make sure to give good stuff. He gets ice cream or things like that occasionally, but never at preschool and very rarely at home. Anyway, I wanted to keep the bento the focus of the post so, didn’t really explain well about how we’re trying to raise him and why we like this particular preschool. The point is not really to get him to accept responsibility and do things for himself — at this age, the point is to encourage him to want to try things. As Fumie says, “at this age, the balance of wanting and being able to do is a fine line.” If he can’t do something, it might instill a feeling of not wanting to try, and a lack of confidence. If he tries but can’t do it, we certainly don’t scold — we praise the effort. At this age, just wanting to give it a try is sufficient for success. The school and its teachers are very much on the same page with us. I had to make the bento for about a week after my third son was born recently. Needless to say, I wasn’t nearly as good as my wife — one or two days they got tupperware instead of the bento bako because I couldn’t find all the accoutrements (you know, you can’t have the Thomas bento bako with the Majiranger chopsticks! ), and there was no special chopping or cutting into shapes. It’s hard work! I also find my kids tend to eat far healthier meals than most American kids. My six year-old eats foods specifically because they are good for him and avoid excess sweets. I don’t think we’ve ever had a problem getting our kids to eat vegetables, which is something I hear a lot of parents complain of, so I suspect giving them these kinds of meals (lots of variety, and including some vegetables) at an early age is an excellent practice.